Aesthetic Design & Build is a reputable provider of retractable awning installations in St. Louis and St. Charles county. 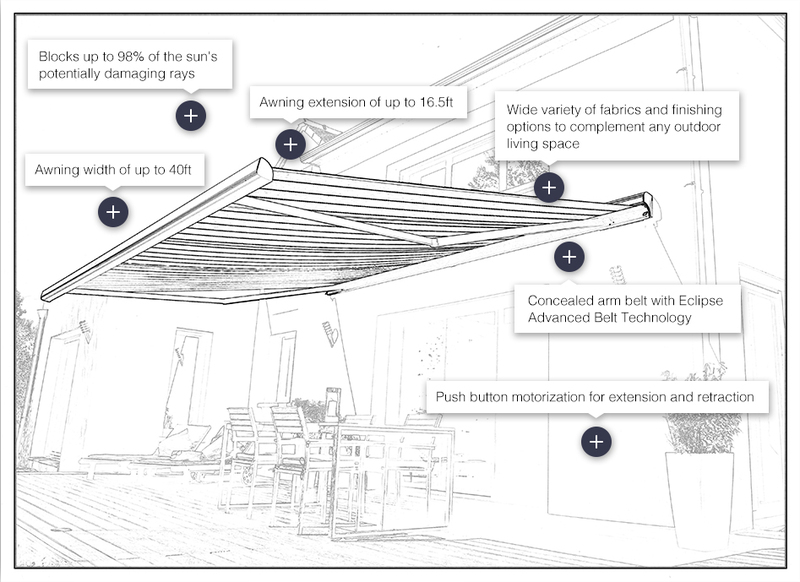 When fully extended, our awnings provide full shade and protection from the sun and harmful UV rays, making it the perfect solution for a patio, outdoor bar and lounge area, or other outdoor living space. Other options include wind and sun sensors and front drop shades to block out harsh west-facing sunlight. Aesthetic Design & Build is proud to be the exclusive St. Louis supplier of Eclipse Shading Systems' custom awnings. The product specifications of Eclipse custom awnings are listed below. Our virtually endless personalization options allow our custom awnings to serve as an extended feature of your home, complementing any design elements already present in your outdoor living space. If you think that an Aesthetic Design & Build custom awning is the perfect solution for your outdoor living space, contact us today or call us at 636-532-5008!